I turned 30 recently and one of my turning points is learning not to compromise my health. I got a big scare early this year when I had a heart problem, and that made me realize that I can sacrifice a lot of things if it would mean I would live a longer life and be able to see more movies, read more books, and spend more time with my loved ones. I don't get to exercise as much as I wanted to but I do get to walk a lot. Clocking in more hours for bedtime is a bit difficult for me but I make up to it by trying to eat more healthily, with try being an operative word. Why is skipping dessert so hard whyyy. 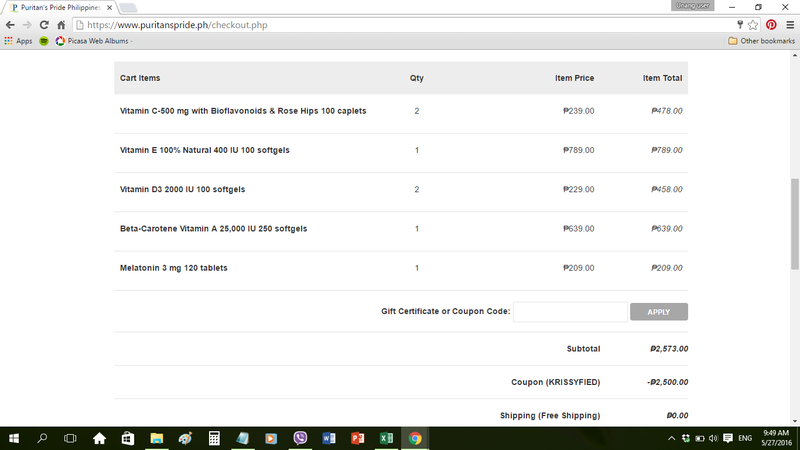 To make sure I get nutrients even when I failon my attempts on a healthy diet, I take vitamins and health supplements. One brand I discovered recently is Puritan's Pride which is said to be one of the leading health supplements and vitamins brand in the USA, now available here in the Philippines via their website. They contacted me and let me try some of their products, and now I'd like to share them with you. By offering the best price, up to 35% lower than other brands, Puritan’s Pride Philippines helps you become healthy on a budget. You are also assured of high quality as they only use ingredients from suppliers that meet their stringent Quality Assurance Standards and GMP food quality standards. All Puritan's Pride Vitamin D formulas are Sunvite D3, a more potent and active form of Vitamin D. Together with Calcium, Vitamin D helps develop strong bones and teeth, and also assists in immune system health. Helps maintain healthy bones in adults. Assists in maintaining a healthy immune system. Supports neuromuscular function. Vitamin C is one of the more popular vitamins with tons of health benefits essential for optimal health. Its health benefits include support for the immune system, antioxidant health, skin care and cardiovascular (heart) system. Found in a variety of fruits and vegetables, this provitamin A, is famous for giving carrots a rich orange color. Readily converts to Vitamin A in the system when needed. Helps maintain the health of eyes. Supports the immune system. Provides antioxidant benefits for the heart and other organs. Helps maintain the skin and health of hair. Sometimes its hard to unwind after a long day. Thats when its time for Melatonin, a hormone naturally produced in the body that is closely involved in the natural sleep cycle. Its a terrific choice if you experience occasional sleeplessness or jet lag, or if you want to improve your quality of rest.and, Melatonin helps you fall asleep quickly and stay asleep longer. I take Vitamins C and D3 in the morning, and then I take Vitamin E before bedtime. I also shared the bottles of Vitamin D3 and Beta Carotene with my boyfriend. As for Melatonin, thank God I haven't found the need to use it yet as I get so tired when I go home at night that I haven't had trouble sleeping lately. I also like the colored bottles for the vitamins and supplements, but I wish they were glass instead. By the way, if you visit their website, there is an expansive gallery that you can check out. (They have over 100 supplements on offer!) For beauty, skin care and whitening, their bestsellers include Glutathione, Collagen, Alpha Lipoic Acid, Vitamin C, and Zinc for Acne. They also have supplements for weight loss, heart, multivitamins, and other aspects of health. They ship nationwide and offer Cash on Delivery as an added means of payment aside from the usual credit cards and bank deposits. Hurry because this offer expires on June 30! ... And then suddenly, a squeak!